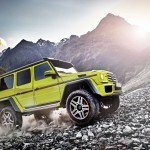 Mercedes will present at the Geneva Motor Show the Mercedes G 500 4×4², the little brother of the G 63 AMG 6×6. 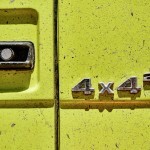 Mercedes delivered the first official pictures of the Mercedes G 500 4×4², the little brother of the G 63 AMG 6×6. Compared with his big brother, the Mercedes G 500 4×4² don’t use the AMG 5.5 litre engine, but the completely new AMG 4.0 litre V8 biturbo. In the case of the Mercedes G 500 4×4², the 4.0 liter biturbo V8 direct injection engine delivers 422 HP. Basically, it is the same engine mounted in AMG GT and the new C 63 AMG with the two turbos placed inside the V configuration, which give many advantages in therms of compact engine design, optimum response and the low exhaust gas emissions. The new engine would meet Euro 6 emission standard. Mercedes was encouraged to develop a 4-wheel drive version of the G 63 AMG 6×6, after a dozen of financially potent customers from the Middle and the Far East have already signed contracts to buy a G 63 AMG 6×6 for a price of around half a million euros. 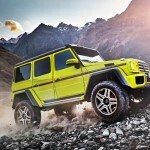 So, Mercedes decided to make a 4×4 version, that takes over the portal axles from the G 63 AMG 6×6. Instead of the rigid axles where the wheel is centered on the shaft axis, for the portal axles the fixing point is placed above and it is connected to the center of the wheel by portal gears, which provide a much greater ground clearance. Like for the G 63 AMG 6×6, Mercedes G 500 4×4² has huge fender flares in carbon fibre to accomodate the enormous tires and the wider portal axles. With a wider track (+299 mm) and with larger 22-inch 325/55 R22 wheels, Mercedes G 500 4×4² offers better stability in bends despite the higher ground clearance of 450 mm. 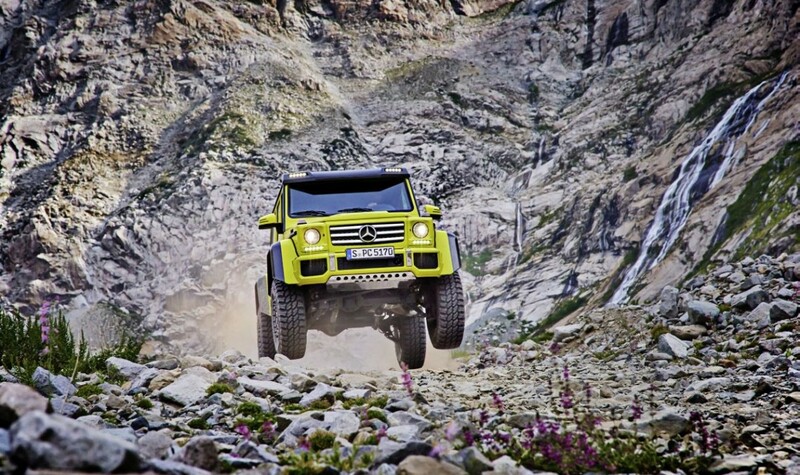 The normal G-Class features a ground clearance of 210 mm. G 500 4×4² has top class off-road abilities and we mention here the fording depth of 1,000 mm, aproach and departure angle of 52/54 grade and a brakeover angle of 47 grade. The Mercedes G 500 4×4² without the third axis features a normal body instead of a four places pick-up and for this reason, we would expect a much cheaper price, estimated to be halved, compared to the G 63 AMG 6×6. Not only the engine is different in Mercedes G 500 4×4². The new chassis has dual spring/damper struts and adjustable damping. One spring/damper strut works conventionally with set damper characteristics. The second spring strut has electronically controlled adjustable damping with two modes – Sport and Comfort – and the switching between the two modes is extremely quick in only 15 miliseconds. Due to Sport mode, wider track and larger tires, G 500 4×4² drives very dinamically through bends for a professional off-roader. 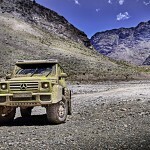 Like G 63 AMG 6×6, G 500 4×4² has special tires: mud/terrain tires in size 37 x 12.5 x 18 inch which can be deflate to a minimum 1.0 bar for travel on sand. The interior follows the luxury treatment from the G 63 AMG with a designo Exclusive package. The dashboard, centre console and armrests in the doors are covered with black designo leather with white contrasting topstiching meanwhile the seats and door panels are covered with Dinamica microfibre. Mercedes-Benz didn’t announce if G 500 4×4² will enter in series production but the final decision will depends on the reaction which the near-series show car receives.